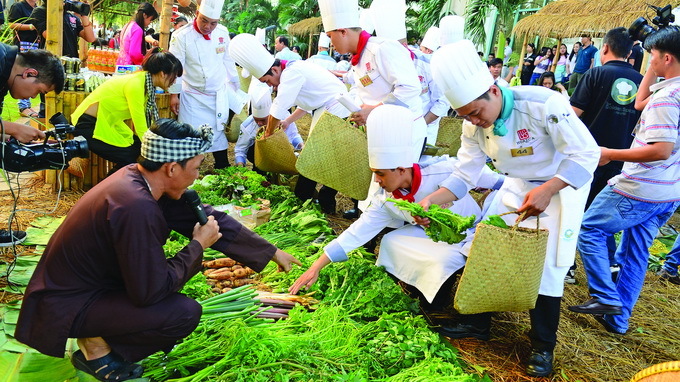 Contending chefs buy raw ingredients for their dishes at the final of the 2015 Golden Spoon Awards, which aims at honoring traditional dishes across Vietnam. Local and foreign food experts have called for a more concerted promotional effort if Vietnam’s world-class cuisine is to position itself at the top of the global culinary pile. Though many Vietnamese delicacies have been ranked on lists of the world’s best food and are gaining an increasingly stronger foothold among international gourmets, the much-coveted title of ‘the world’s kitchen’ remains elusive, according to experts. Chiem Thanh Long, a local cuisine pundit, told a meeting jointly organized in November 2015 by Tuoi Tre (Youth) newspaper and local porcelain maker Minh Long 1 that most Vietnamese restaurants in other countries are not run by nationals from the Southeast Asian country. These restaurateurs even do not employ any Vietnamese staffers and offer unauthentic Vietnamese dishes. However, their business thrive under the Vietnamese brand name, Long noted. For instance, such shops prepare ‘goi cuon’ (salad rolls), a favourite among foreigners, the size of an adult’s wrist, with the rolls stretching approximately 23 centimeters in length. Foreign diners queue up for a taste of the unauthentic dish. “This is indicative of the increasing popularity of Vietnamese specialties, but we producers have not fully tapped into the potential,” Long noted. French master chef Sakal Phoeung, executive chef with Sofitel Saigon Plaza and president of Disciples d’Escoffier Vietnam, acknowledged the lack of effective promotional efforts by the Vietnamese government and gastronomy insiders. Disciples d’Escoffier Vietnam is the Vietnamese chapter of Disciples d’Escoffier, a French association dedicated to the culinary arts and the transmission of knowledge. Phoeung pointed out that many Europeans merely know that the appetizing ‘goi cuon’ derives from an Asian country. A statesman of a European country even ordered ‘goi cuon’ at a Chinese restaurant in China. The chef stressed that though Thailand and Cambodia do not boast as many signature dishes as Vietnam does, and Thai food is spicier and more pungent, their gastronomies are better known globally thanks to proper promotional programs. “With Vietnam lagging behind its regional peers in placing its cuisine on the world map, the country is advised to start taking action now,” he strongly urged. Further promotion will also help the export of Vietnamese ingredients and spices to other countries. Meanwhile, culinary expert Bui Thi Suong noted that despite its seemingly plain looks, Vietnamese gastronomy prides itself on delivering a rich experience passed down from generation to generation. The country’s cuisine has the strength of being both a rich and nutritious balance based on the application of scientific knowledge somehow known to people in old times. For instance, people habitually stew green papayas or pineapples with tendinous meat to tenderize it. Suong, who is known within the local industry thanks to her role as a juror in several cooking contests at home and abroad, revealed that during such contests, many eye-catching and sophisticated European dishes were not highly appreciated. By contrast, a bowl of plain-looking ‘canh chua’ (sweet and sour soup) which can be cooked by most Vietnamese housewives is enthusiastically hailed and scores high. “With better advertising, such bowls of ‘canh chua’ can easily become tempting highlights,” Suong noted. Dr. Do Thi Ngoc Diep, director of the Ho Chi Minh City Nutrition Center, insisted that promotional efforts also highlight the health of Vietnamese food, which is manifest in the use of rice flour instead of insulin-high, obesity-related wheat flour, as well as a wide range of vegetables and spices. Such ingredients are of immense health benefits when it comes to the prevention of cancer and non-contagious chronic illnesses, as well as boosting users’ immunity to harmful bacteria and adverse environmental effects, Dr. Diep pointed out. Up to nine groups of food recommended by the World Health Organization as cancer preventers are among Vietnamese staples. However, the dietician underlined that Vietnamese cuisine is lacking in systematic identification. “Thai restaurants are instantly recognizable in other countries with their hallmark purple and yellow in their décor, while their Chinese counterparts are invariably red,” she elaborated. Dr. Diep also underscored the necessity to introduce a selected range of Vietnamese specialties, including ‘pho’ (noodle soup with beef or chicken), and ‘cha gio’ (fried spring rolls), not bewildering international diners with an undue focus on regional features. Vietnamese gastronomy also needs consistency in how its food is arranged and served, and sizes and nutritious values of each portion must also be equal. As South Korea has successfully launched their Hansilk campaign, which features handsome, capable cooks, in a bid to vigorously promote their food to the world in recent years, experts are of the opinion that Vietnam should also be doing the same thing. French chef Phoeung asserted that Vietnam needs a special team, consisting of top chefs, to represent the country in overseas campaigns to promote Vietnamese culture, tourism and cuisine. Such a team should include the participation of leading chefs and culinary schools, and support from the government, he noted. The team members will showcase how to prepare signature Vietnamese foods in front of expectant international gourmets at the world’s biggest travel fairs or major events, the French chef explained. Le Vo Anh Duy, chef at the Binh Quoi 1 tourism area in Binh Thanh District, Ho Chi Minh City, said the country’s culinary delights should also be incorporated in Vietnamese films and publications released worldwide. Ly Huy Sang, deputy general director of Minh Long 1, also emphasized the need to ensure food safety, as all promotion efforts would be in vain if diners are surrounded by constant news coverage of poor food hygiene and poisoning. “As a Vietnamese saying goes, ‘The quickest way to someone's heart is through their stomach,’ all hurdles can be overcome with ease once we are infatuated with a country’s food,” Sang said.